Here are the most commonly asked questions about all our products. We also have FAQs for each of individual products on their respective page, please visit our product section and locate the product you have questions about to find out more information. Please note that we are unable to give out any medical advice, diagnose or prescribe any treatment for any condition. Please consult your Health Care Practitioner for questions of this type. Looking for a better butter coffee? Try Emulsified MCT Oil – it’s healthier for you and easier! Medium chain triglycerides (MCTs) are the most beneficial fats found in coconut oil. They are efficiently absorbed and easy to metabolize, providing a sugar-free source of energy for workouts, and reducing hunger signals. MCT oil has also been shown to support age-related cognitive decline as well as conditions like Alzheimer’s. 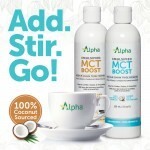 Adding Alpha Emulsified MCT Boost to your morning coffee, tea, orange juice or shake provides an easy way to energize your day. Why Have Emulsified MCT Boost in Coffee? If you are using MCT oil you already know it gives you a great energy boost in your coffee, tea, oatmeal, yogurt, salads and more. It provides healthy sugar-free energy for workouts, weight loss, body building and is also suitable for anyone on a paleo or ketogenic diet for weight management, chronic illness or cognitive support. But the need for a blender can be time consuming and messy. Emulsified MCT oil skips the need for the blender. Emulsifying the MCT oil allows it to mix easily with liquids. Use it just like a creamer. No blender, no mess and no cleanup. All the benefits of MCT oil made simple. How Do We Emulsify MCT Boost? The emulsification process breaks the oil up into smaller parts so it mixes easily with other liquids. Without emulsification, the oil does not mix well with liquids. Our emulsification process uses the gum Arabic, a natural, water-soluble fibre, as the emulsifying agent. 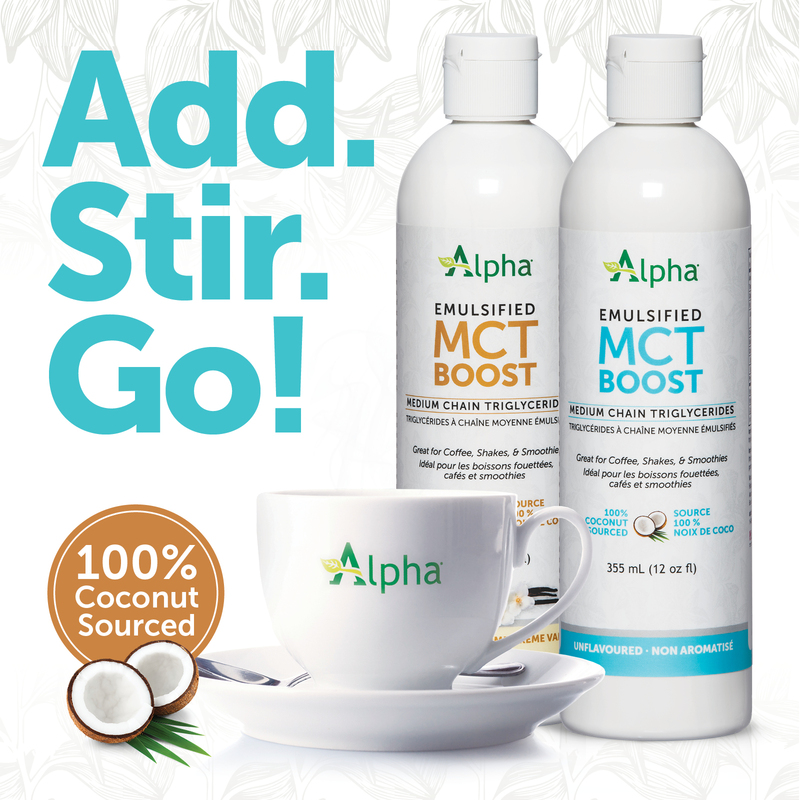 Once the coconut oil breaks apart in the mixing process and is dispersed within the water, the emulsifying agent prevents it from separating back to its original form – leaving a creamy emulsified MCT oil. Most oils used in coffee, tea, smoothies or other beverages require mixing with a blender for effective dispersal of the fat – often still leaving an oil slick on top. Emulsifying the MCT oil allows it to mix easily with liquids – without the need for a blender. Just add, stir and go. This entry was posted in Health Information, Men's Health, Nutritional tips, SuperFoods, Supplement Facts, Wellness Solutions, Womens Health and tagged alpha health, emulsified, ketogenic, mct boost, mct oil, MCTs, paleo. Bookmark the permalink.